Ellen Marie Feeney is the daughter of Timothy Feeney and Mary Ann Fitzgerald. Karen Suzanne Feeney married Greg Parker. Karen Suzanne Feeney is the daughter of Timothy Feeney and Mary Ann Fitzgerald. Tara Lynn Feeney is the daughter of Timothy Feeney and Mary Ann Fitzgerald. Shane Matthew Feeney is the son of Timothy Feeney and Mary Ann Fitzgerald. Maureen Francis Feeney is the daughter of Timothy Feeney and Mary Ann Fitzgerald. Erin Colleen Feeney is the daughter of Timothy Feeney and Mary Ann Fitzgerald. John Algot Lindgren III married Patricia Feeney, daughter of Francis Martin Feeney and Helen R. Curran. [S1367] Email from Nicole Hill dated July 2010 to Hunter Wayne Bagwell; Subject Line: Decendants of Francis Martin Feeney and Helen Curren. John Algot (Jack) Lindgren IV married Jackie Hoster. John Algot (Jack) Lindgren IV is the son of John Algot Lindgren III and Patricia Feeney. Meghan Lindgren is the daughter of John Algot (Jack) Lindgren IV and Jackie Hoster. Mitch Lindgren is the son of John Algot (Jack) Lindgren IV and Jackie Hoster. Eleanor Ann (Elly) Lindgren is the daughter of John Algot Lindgren III and Patricia Feeney. Susan Michele Lindgren is the child of John Algot Lindgren III and Patricia Feeney. (Unknown) Goslin is the child of David Goslin and Sheri Baileau. Her Social Security Number was (an unknown value) at 317-48-0735. 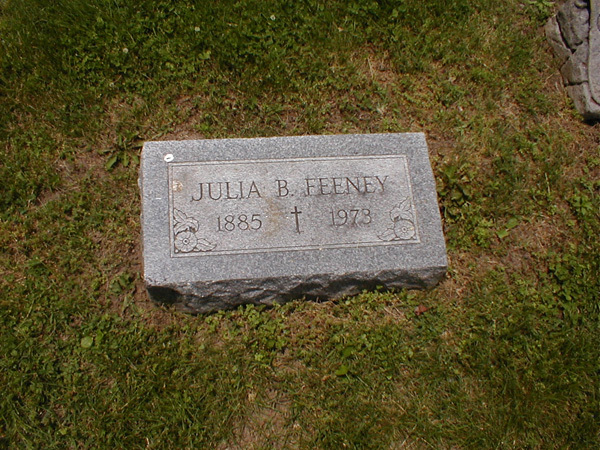 Julia B. Feeney was born on 16 January 1885 in Indiana.1,2,3 She was the daughter of Thomas Feeney and Margaret O'Dea Hughes.2,3 Julia B. Feeney died on 7 April 1973 at age 88. She was buried at Calvary Cemetery, Indianapolis, Marion County, Indiana. [S269] United States Federal Census, Washington, District of Columbia, Population Schedule: Washington Township, Hendricks County, Indiana, Emuneration District: 40, Supervisor District: 5, Sheet: 5A, Dwelling: 88, Family Number: 90, Date: 1900. [S432] United States Federal Census, Washington, District of Columbia, Population Schedule: Brownsburg, Hendricks, Indiana, Emuneration District: 16, Supervisor District: 7, Sheet: 1B, Dwelling: 17, Family Number: 17, Date: 1930. [S433] United States Federal Census, Washington, District of Columbia, Population Schedule: Lincoln, Hendricks, Indiana, Emuneration District: 41, Supervisor District: 5, Sheet: 1B, Dwelling: 25, Family Number: 25, Date: 1920. Thomas J. Feeney was born on 3 April 1887 in Indiana.1 He was the son of Thomas Feeney and Margaret O'Dea Hughes. Nora Feeney was born on 2 September 1888 in Hendricks County, Indiana. She was the daughter of Thomas Feeney and Margaret O'Dea Hughes. Nora Feeney died in 1891. Timothy (Little) K. Feeney was born in April 1891 in Indiana.1 He was the son of Thomas Feeney and Margaret O'Dea Hughes. Timothy (Little) K. Feeney married Margaret Helen Walsh after 1910. 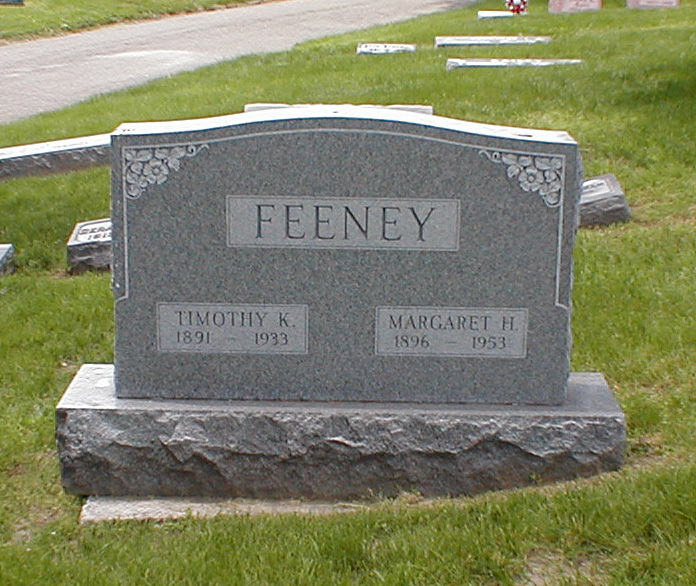 Timothy (Little) K. Feeney was buried at Holy Cross Cemetery, Indianapolis, Marion County, Indiana. He died in 1933. Bethany Snyder is the daughter of John Alan Snyder and Terri Wilbanks Henry. William Gregory Bradley is the son of William Earl Bradley. William Gregory Bradley married Elizabeth Lee Engle, daughter of Leonard Howard Engle and Norma Isabelle Hullinger, on 6 May 1977 at Saint Andrew's Catholic Church, Indianapolis, Marion County, Indiana. William Gregory Bradley and Elizabeth Lee Engle were divorced on 18 July 1990 at Indianapolis, Marion County, Indiana. Chester Wayne Dyer married Elizabeth Lee Engle, daughter of Leonard Howard Engle and Norma Isabelle Hullinger, on 22 July 1990 at Indianapolis, Marion County, Indiana. Rachel Lorraine Marie Dyer is the daughter of Chester Wayne Dyer and Elizabeth Lee Engle. Daniel Francis Casey married Jane Ellen Hutchcraft on 12 November 1966 at Knox, Starke County, Indiana. 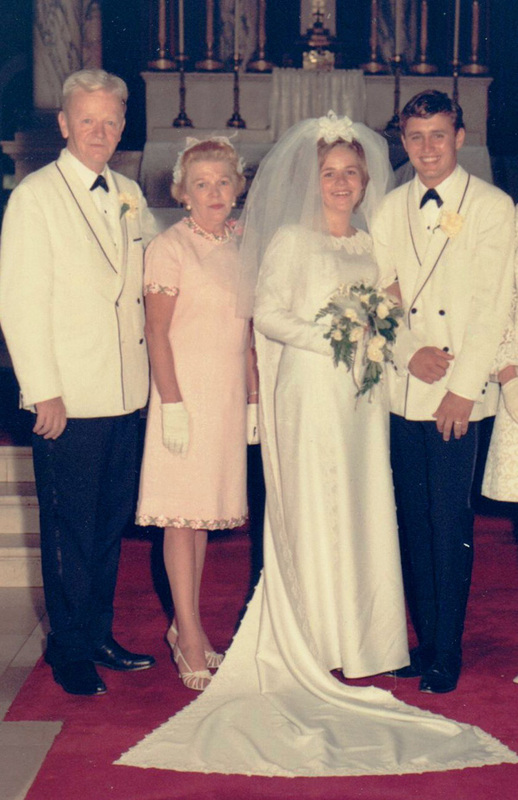 Jane Ellen Hutchcraft married Daniel Francis Casey on 12 November 1966 at Knox, Starke County, Indiana. John (Jack) Bagwell was born in 1776 in North Carolina. He was the son of William Bagwell and Elizabeth Sara Stone.1 John and Frances settled adjacent to her family who had been in Laurens County on Line Creek since 1787. They lived in Greenville and Laurens Co., SC. They may be buried near Pendleton, SC. John (Jack) Bagwell married Frances Hulsey on 15 September 1795 at Anderson County, South Carolina. John (Jack) served in the War of 1812, U.S. Army 6 under Captain John Nabors, 3rd Regiment SC Militia (Alstons) South Carolina. He served from 6 Nov 1814 to 8 Mar 1815. He was a private in Capt. John Nabor's Company of Infantry, Regiment South Carolina Militia commanded by Lt. Col. John A. Alston. Apparently, John Bagwell was too old to be drafted, but he substituted to in the place of Thomas Kinman who was drafted in Laurens District. He was discharged in Georgetown. He died on 22 July 1839 in Princeton, Greenville County, South Carolina. Frances Hulsey was also known as Hurley. She was born in 1781 in Anderson County, South Carolina.2 John and Frances settled adjacent to her family who had been in Laurens County on Line Creek since 1787. They lived in Greenville and Laurens Co., SC. They may be buried near Pendleton, SC. As of 15 September 1795,her married name was Bagwell. She married John (Jack) Bagwell, son of William Bagwell and Elizabeth Sara Stone, on 15 September 1795 at Anderson County, South Carolina. Frances Hulsey lived in 1850 in Greenville, Greenville County, South Carolina.1 She lived in 1850 in Greenville County, South Carolina.2 She died in 1866 in Pendleton, Anderson County, South Carolina. [S2171] United States Federal Census, Washington, District of Columbia, Population Schedule: Greenville, South Carolina; Sheet: 191 / 414A, Dwelling: 1409, Family Number: 1409, Date: 1850. William Hitch Bagwell was born in 1796 in Laurens County, South Carolina. He was the son of John (Jack) Bagwell and Frances Hulsey. William Hitch Bagwell married Elizabeth Wallace Rowe in 1817. William Hitch Bagwell died on 23 March 1841 in Floyd County, Georgia. [S1371] John W. Bagwell Grave Stone, Find a Grave, www.findagrave.com. Roadside Historical Marker: Shiloh Methodist Church and Cemetery was established ca. 1836, Shiloh Methodist Church was disbanded by 1875. Remaining members joined other churches in area, including Mt. Airy, Chestnut Grove, and Bethel. Frederick and Margaret Crawford Bagwell, early settlers of Choctaw County, are buried in the Shiloh Church Cemetery. He died on 2 October 1864 in Choctaw County, Mississippi, at age 64. He was buried at Old Shiloh Methodist Cemetery, Choctaw County, Mississippi, The inscription on the head stone reads: "Frederick Bagwell was born in Greenville District South Carolina. Married at 19 years of age and moved to Shelby County, Alabama and then moved to Choctaw County, Mississippi about 1835. Died October 2, 1864. Aged 64 years 9 months, 1 day.2"
[S357] United States Federal Census, Washington, District of Columbia, Population Schedule: Subdivision 23, Choctaw, Mississippi, Page: 58 or 140 (both entries on page), Dwelling: 409, Family Number: 409, Date: 1850. [S243] Mississippi Department of Archives and History, Historic Roadside Marker: Shiloh Methodist Church and Cemetery, 1998.